Spring is perhaps the best time to be here due to the flowers' bloom! Blessed with moderate temperatures all throughout the year, residents of the Homes of Rivera Dunes enjoy the outdoors twelve months a year. Yes, summers can be on the humid side, but eight months of the year have ideal weather. Even in the summer, early mornings and late evenings are often pleasant enough for a walk or a jog. Many areas in Palmetto and Manatee County are bird sanctuaries. Birds are protected and thrive here like nowhere else. If you are a bird enthusiast, you will thoroughly enjoy walking the Rivera Dunes grounds all year around. Above are some of the birds observed in our community. 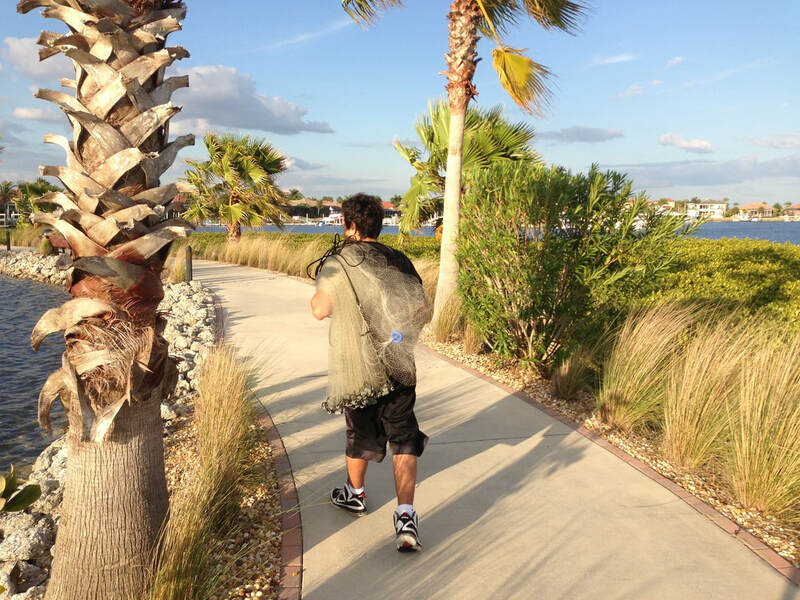 These pictures are courtesy of our resident Ginny Wood, who was a finalist in the 2019 Photography Challenge for Manatee County’s Parks, Preserves, and Beaches. The beauty, cleanliness and water scenery is absolutely stunning at Riviera Dunes! Even if you are not a jogging or walking enthusiast, simply going outside and sitting on one of the community benches is a pleasure not to miss! The roads at the Home of Riviera Dunes are structured to create unlimited options for walkers and joggers to cover as much or as little distance as desired. For instance, walking from the cul-de-sac on 12th Ave E to the Dockside restaurant is about one mile long. If you add the hammocks it adds half a mile. The 4 other cul-de-sacs (8-11th Ave E) add another half a mile. You can hence walk as little as half a mile or as long as you wish by adding more loops around the hammocks and cul-de-sacs. Also, consider adding to your stroll any of the community docks. They will further diversify the scenery. It is also always great to have more residents on the docks keeping an eye on the boats in our harbor and making sure they are all secure. Walking and jogging are considered some of the best cardio activities for most ages. In addition to strengthening your heart, you can loose weight, tone up your muscles and get healthier. The community also is very friendly. By being out there, you will have more of a chance to meet others and better know your neighbors. This atmosphere or friendliness adds tremendous comfort and reduces stress. 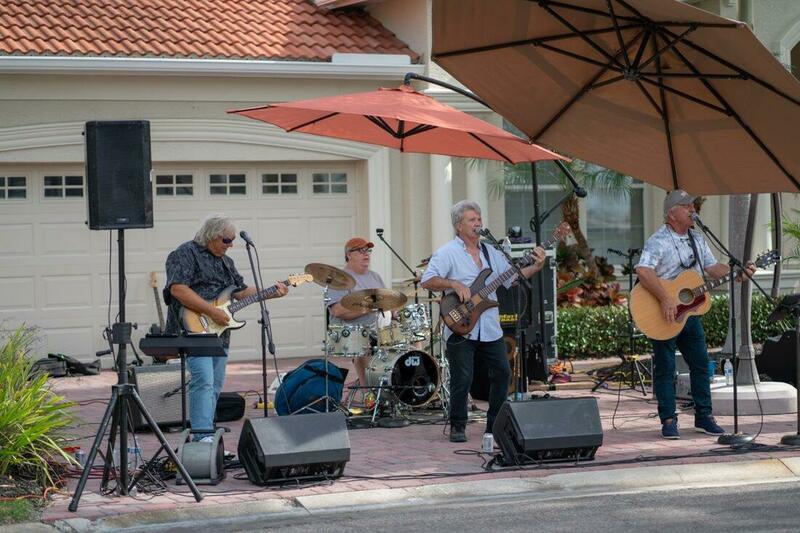 The Riviera Dunes community has recently held its first Block Party and Pig Roast which was a great event that brought many of the residents together. If you live in the Riviera Dunes community, you should take advantage of the amazing facilities that surround you by getting out more often. If you are interested in living in the Homes of Riviera Dunes, you can contact us using the form here. See you all out on a walk soon! 204 photos compliments of Rick S. and Ginny W. Download at will. For high-res versions, request form here. Over a hundred people from the Homes of Riviera Dunes residents got together on Saturday April 13th, 2019 to enjoy a block party and pig roast hosted by the 12th Ave E residents. The cul-de-sac was transformed for the event into the party center! Many residents from all the communities at HORD enjoyed the event that was featuring the Billy Rice Band and a smoked pig roast that slowly cooked over 14 hours. Community members pulled together to organize this first block party event at Riviera Dunes to turn the event into a smashing hit. ​"Mom really put a lot of efforts into bringing the community together for this wonderful event," said Julien Freij. "I was very proud to see her hard work pay off so beautifully. I got to have a lot of fun, meet many wonderful neighbors and better know my community," Julien added! "Thank you so much for all the work you had done to make the Pig Roast a definite success !! I know how much work it takes to pull an event like that off and it came off beautifully… Please thank Jen (and Terry) also and everyone else involved (I don’t know the names of the others)…. Julie for the ‘main food event’… Bob and I really enjoyed ourselves and got to meet a couple more neighbors and catch up with the others…I loved, loved, LOVED the band…" one resident wrote. "What a great event! Elena and I thoroughly enjoyed ourselves and meeting some of our RD neighbors. Everything was right, great band, way too much good food. Can we keep the beer tap as a neighborhood feature... operating 24/7?... would make a nice stopover on our walks! Perhaps it will happen again... we will help next time..." wrote Tom and Elena B. The weather, although a bit on the warm side, was pleasant due to a thin cloud layer in the sky that cut down the sun rays, and a southern breeze that brought with it the citric scents from Tropicana. Billy Rice and his band were fantastic! They played from 3:30 to 7:30 pm with very few interruptions. Some of the favorite songs that they played were My Girl, Tennessee Whisky and Ride Sally Ride, which all drew heavy dancing crowds. They sure made the party very special and we are very grateful to them! 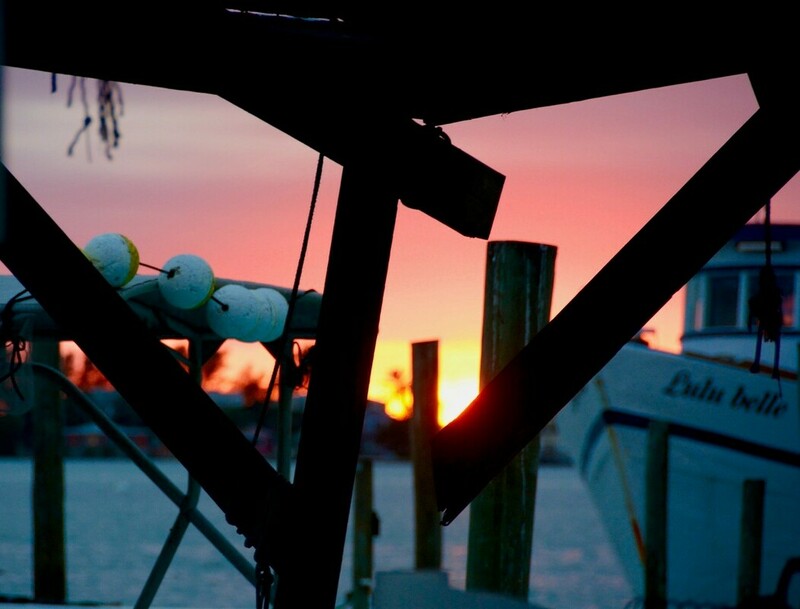 It was one of the best sunset evenings we have experienced. Sincere Thanks to All Who Helped! This event would have not been as successful if it wasn't for the selfless help the organizing group received from the entire community. Special thanks go to Julie and Jay L. for their relentless oversight of acquiring and cooking the pig, which included pulling an all-nighter on the cul-de-sac to monitor the proper temperature and smoking process. Also, our deepest gratitude goes to Ginny W., Pam D., Emily B. for their many trips to acquire supplies and gift certificates from local vendors. Thanks to Ken M. and Dave W. for assisting residents with obtaining their party tickets and name tags. The photos are compliments of Ginny W. and Rick S. There are 204 uploaded images in the above photo gallery that you can view and download. If you need high-res copies, contact us using the form here. Specify which image you would like to receive. Additionally, thank you to all that brought food dishes, tents, chairs, tables, toys and all else that made the party so special! A group of residents from the Homes of Riviera Dunes rode their bikes today to DeSoto Park. It was a crisp cool morning with the usual low traffic experienced on Saturdays. We crossed the Green Bridge heading south in the pedestrian lane and were pleased to see the lane fully completed. 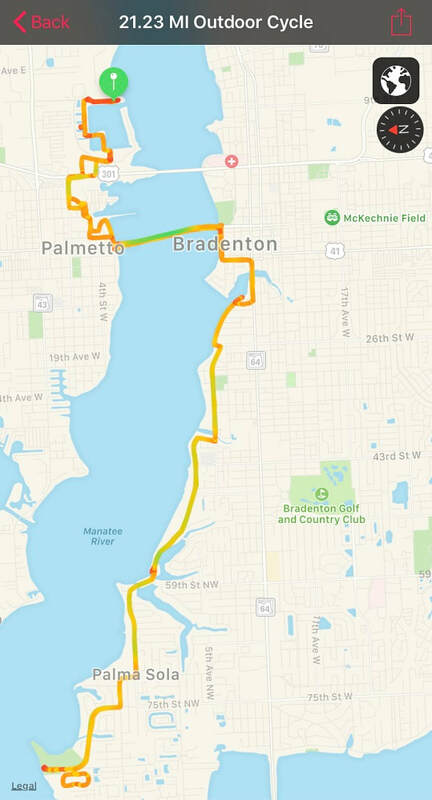 After we got on Riverview Blvd, the road became very bike friendly all the way to DeSoto Park. The park was closed due to the government shutdown, but pedestrians and bikers can get in. After a short break at the park, we all headed back and worked up our heart rates with some really nice sprints along the way. 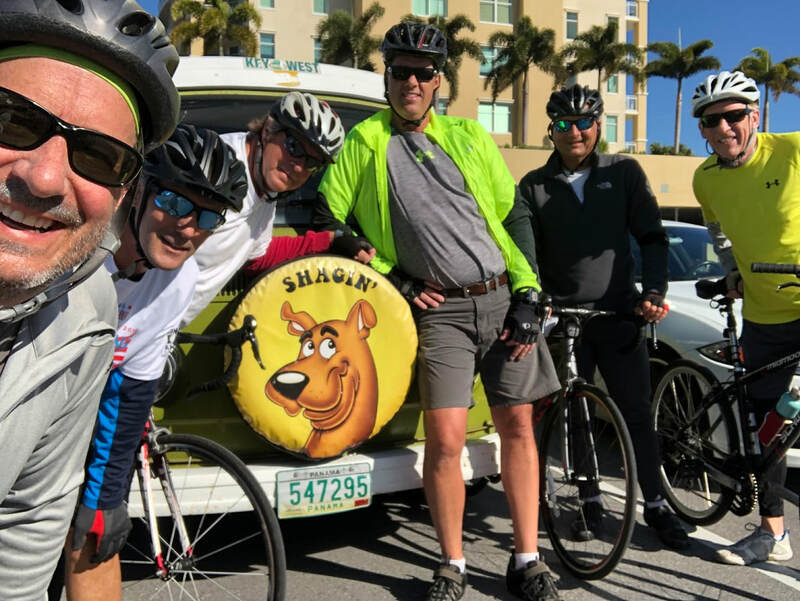 Everyone made it back safely for a photo opp by an old Scooby-Doo van in the marina parking. The trip was a little over 21 miles and we run it at an average of 11.5 miles per hour. The group rides 3 or 4 times a week, often to Emerson Point. If interested in joining this group, submit your name and tel/text number on the contact form. The Riviera Dunes Yoga classes taking place at the Amenity Center on Monday and Thursday mornings from 9-10 are off to a good start. They quickly grew in attendance and popularity and many participants have become familiar faces at the gym. 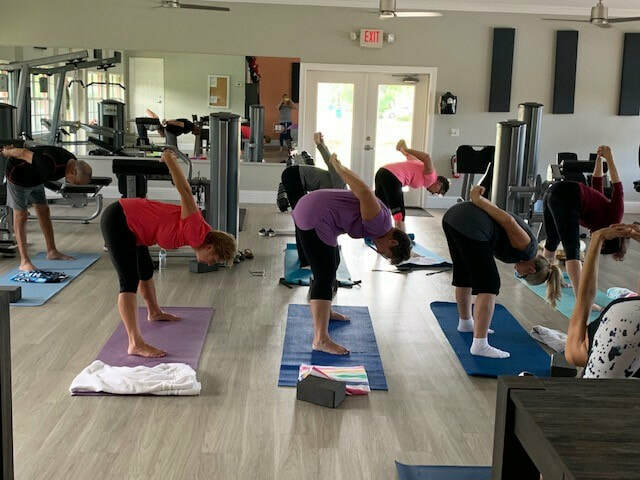 Riviera Dunes Home Owners have been enjoying Sharon's Yoga classes thoroughly and it is wonderful to have a great turnout each and every week! "Participating in the new yoga classes at the Amenity Center has been a great opportunity for me to meet other Riviera Dunes residents and provide a new "twist" to a healthier me," said Janice Davis, who frequently attends the classes. "Having yoga classes available in the neighborhood sure is easy and convenient," John Bessey said. "Sharon is a great instructor keeping it interesting and fun as we are all getting more flexible each week", he added. Generally, this is supposed to be a great beginner yoga class. Taught by Sharon Donnell, a Rivera Dunes resident, who has 200+ hours of experience. But participants are finding out that it is also good at any level because Sharon shows everyone how to modify each pose. Those who like to take it easy can get into a child's pose while others are attempting the more challenging planks! Everyone gets something from each and every class! Any feedback that you would like to share about the class should be sent to Sharon. Also, make sure to reserve your place for each class by e-mailing Sharon at sharond519@sdonco.com before noon the preceding day. ​Donations are accepted, but no more than $5 per class. This year the hospitality committee organized the Autumn Gathering which took place this past Sunday at the Amenity Center in the Homes of Riviera Dunes. Many of our community members participated and brought with them a variety of delicious dishes for everyone to sample. With over 60 people showing up, there were not much food left for anyone to take home! We all socialized, ate, drunk and watched a beautiful autumn sunset materialize right before our eyes by the poolside. It was a cool evening and a beautiful event that everyone enjoyed. Thank you Emely B. and Carleen J. for your efforts in organizing this special evening. We look forward to be part of your future events. 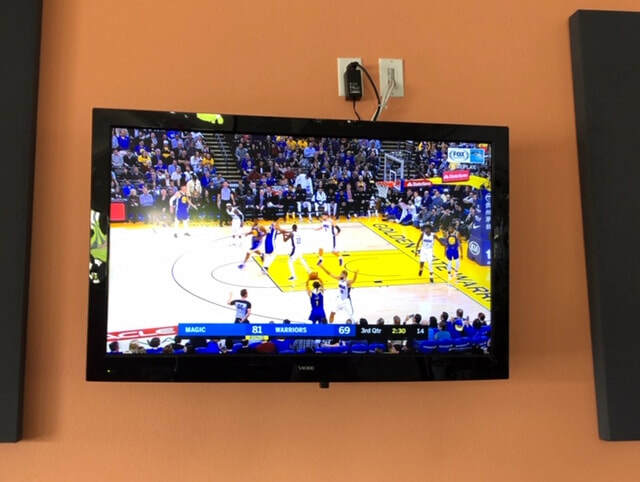 After Spectrum discontinued broadcasting analog TV signals over their cable network, the three TVs in the amenity center stopped working. With the leadership of the board and Bill Dianni, all TVs are now back in operation. They all now support HDTV signals with added channels and crisp resolutions. The two remote controls that controlled the three TVs have been replaced to operate the invisible cable box behind each TV and TV power. The board would like to thank Bill for his help and the patience of all our amenity center regulars for allowing the necessary time to get the cable service restored. Bill Dianni has also been very graceful in allowing the dock committee store pedestals, boxes and crates in his home garage. He has the board's gratitude and appreciation. Earlier in the year, half were replaced and now all are replaced with sleek new pedestals topped by blue caps. They supply power, water and lighting to the docks. 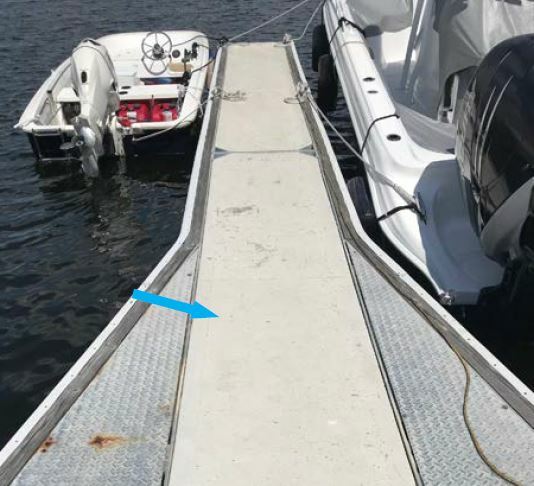 Take a walk down any of the three community docks and check them out in person. Our Home Owners' Association Board and Dock Committee are to be congratulated for not only getting the job done, but also for doing it with as little funds as possible. First, they negotiated a great deal on the new pedestals. Then by purchasing and shipping them in bulk, using residents' vehicles and garages to store them, and doing much of the installation work themselves, they saved over 50% on individual replacement costs! 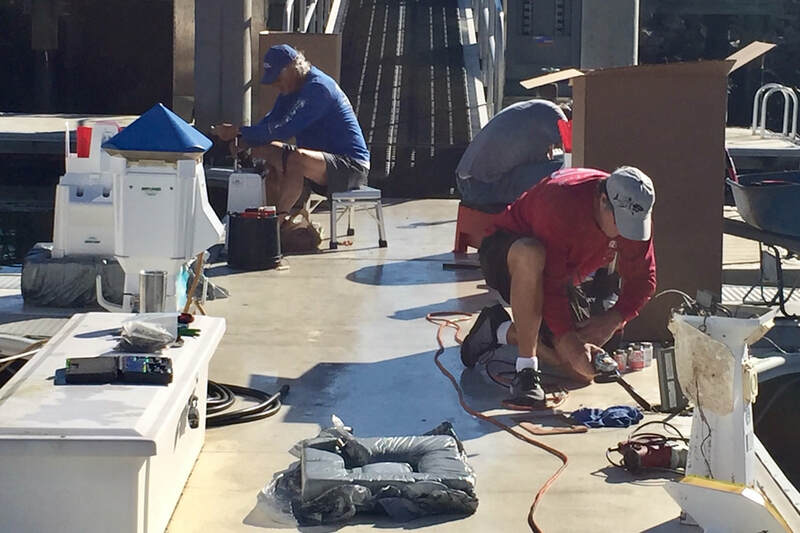 Thanks to the dynamic duo, Ken & Ken, to Don the electrician and to everyone else that assisted in the process, Riviera Dunes slip owners and licensees will enjoy the new pedestals for many years to come! On our morning bike ride this Sunday, we met David Skaggs at Emerson Point. 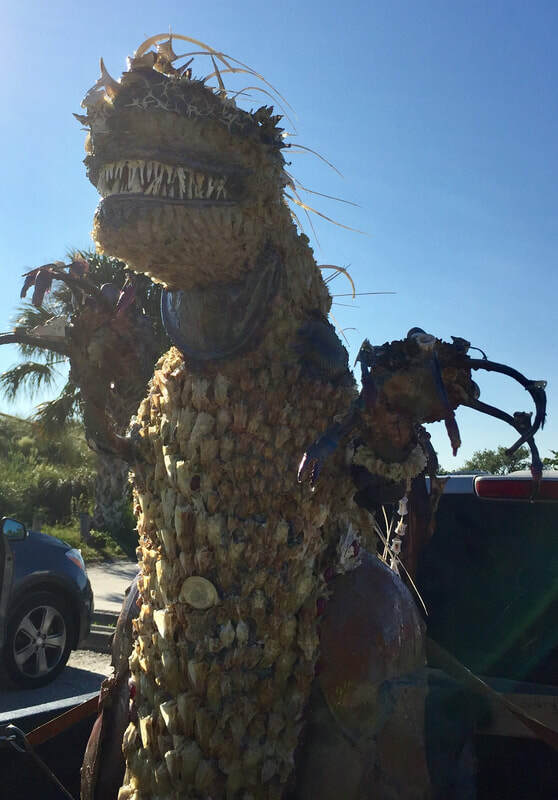 ​David is a local artist that was hauling on his truck bed his latest creation, a Godzilla-like depiction that he called the Red Tide Raptor! The sculpture was made from skeletal remains of all kinds of victims of the Red Tide that washed up on the Gulf of Mexico's shorelines. If you look closer, you can see fish heads, shoe crabs, eels, crabs, fish teeth... forming the entire body! With his art, David shows the devastating impact of the Red Tide on Florida's marine life while simultaneously making a very powerful statement for the need to fight this monster. David bleached all the remains before he used them and covered it all with epoxy resin. 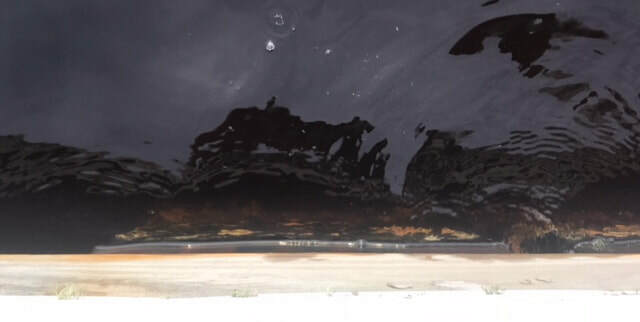 While a tangible visual reminder of the Red Tide was very welcomed and quite motivating to want to do something to solve this serious problem, we were truly thankful that he did not attempt to make us relive our unpleasant Red Tide olfactory experiences!